For courses in derivatives, options and futures, financial engineering, financial mathematics, and risk management. 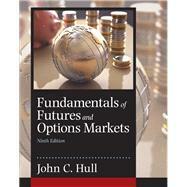 Fundamentals of Futures and Options Markets covers much of the same material as Hull’s acclaimed title, Options, Futures, and Other Derivatives . However, this text simplifies the language for a less mathematically sophisticated audience. The Ninth Edition of Fundamentals of Futures and Options Markets offers a wide audience a sound and easy-to-grasp introduction into financial mathematics. John Hull is the Maple Financial Professor of Derivatives and Risk Management at the Joseph L. Rotman School of Management, University of Toronto. He is an internationally recognized authority on derivatives and risk management with many publications in this area. His work has an applied focus. In 1999 he was voted Financial Engineer of the Year by the International Association of Financial Engineers. He has acted as consultant to many North American, Japanese, and European financial institutions. He has won many teaching awards, including University of Toronto’s prestigious Northrop Frye award.